lock the mistakes away, effectively hiding them, so you don’t have to deal with them. 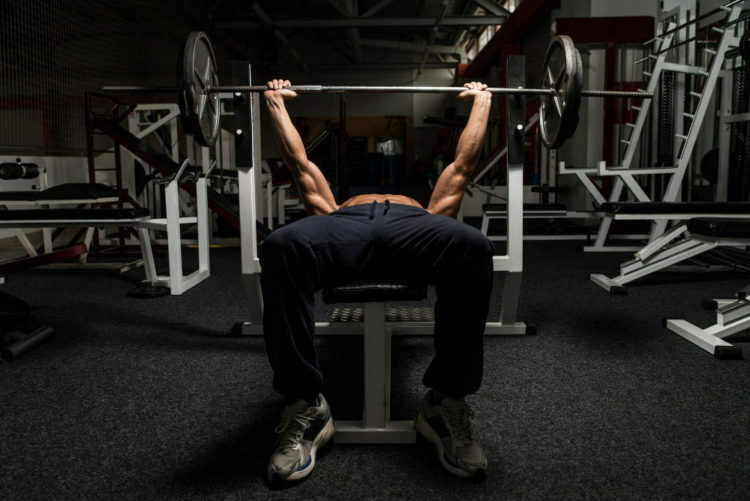 As an example, let’s discuss how the options apply to the bench press. The act of pressing something very heavy away from the chest has an equal and opposite action—to push the upper body away from the lower body. This is called upper body extension: the chest moves away from the center of mass, which for most people is at the pelvis. In other words, your spine bends backwards and your hips may extend, while your pelvis moves forward. If you have a responsive nervous system, you’ll deliver a “feed forward” signal to the muscles that stabilizes the pelvis to the trunk, i.e. the core, by planning ahead and bracing for this separation so it won’t occur. If you have a not-so-responsive nervous system, stabilizing against this separation may be delayed and less effective. In some individuals experiencing pain, and even more so with associated movement limitations or asymmetries, the nervous system may not be as responsive as it was before the problems began . Sometimes, in a given task, we will see muscle activity increase, and in a different task, that same muscle will have decreased activation. From there, mechanical changes occur and change movement behavior. The movement changes are great for short term protection—that’s one benefit of locking out. Protection of the painful or uncontrolled region(s) and protection of the region from suffering is an underlying natural response to pain, absent or inadequate control. The long-term consequence of this sequence of events that changes how we move ultimately is dysfunctional movement, and that’s what we see clinically, all the time. In the circumstances of delayed or reduced control of movement, you’ll find it harder to push the weight away for reasons related to control of movement rather than upper body pressing strength. Anyone who has done a trunk stability push-up as part of the FMS will know exactly what we mean. In individuals with movement mistakes, the natural fix for delayed or reduced anterior stability is to create as much spine extension as possible so it has no more extension left, thus removing or locking away the mistake. In other words, the tendency is to move into extension towards the limits of joint and tissue mobility rather than stabilizing for the most efficient and effective position. You will know when this occurs, because although your feet are positioned well underneath you, your spine and hips are arching backwards. The position just described sets up the lower anterior chain (thigh muscles, abdominal muscles and all associated fascia) into a lengthened and tensioned position. The farther your feet are under you, the more the pelvis is dragged forwards towards anterior tilt, dragging the spine with it into more extension. The more spine extension you start with, the less range of movement the spine can move into when the loaded weight separates the chest away from the pelvis. In any given lift, engaging more muscles enhances the neural drive, feeds forward to open more neuromuscular junctions at those muscles actively contributing to the movement. What if some of this neural drive is “leaked” and is used to compensate for the lack of anterior stability? Some would say the concept of “leaked energy” does not apply when bench-pressing because the bench is supporting your back. Such a leak does happen, but at a reflex level, whether you think it’s there or not. 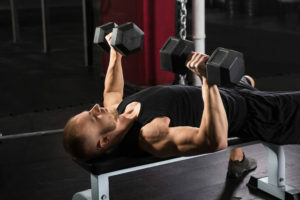 Of course in a bench press, the chest actually can’t move backwards, but the pelvis can indeed move forwards and that’s just a different expression of the same movement. You either stabilize against the spine extension movement through appropriate anterior and lower chain reflexive tension, or if there isn’t adequate control of extension, the body parts can be positioned closer to the end-range of mobility, compensating for this lack of control and thereby creating the necessary starting tension. Again, these are your two options: reflexively control against extension or lock it out to start with. There are reasons to employ one option over the other . . . your decision hinges on why the bench press is being used in exercise. To develop hypertrophy in the chest and arms. Athletes with a desire to gain weight for reasons of inertia, like contact sports athletes without weight restrictions—think front pack rugby players; and bodybuilders. Let’s delve into the first reason—to develop pressing strength. There can be many reasons for developing pressing strength, but they mostly boil down to just two things: the powerlifting category of pressing for pressing’s sake, or the applied movement category of pressing to fend off or launch another object or human. In the first case of our powerlifter, locking out spine extension has few consequences. The bar travel distance is shorter so the length-tension relationship is optimized. Many people make the mistake of copying the powerlifting technique, but they lose the opportunity to learn to control such a force over greater ranges of motion. This is critical where improving strength must go hand-in-hand with improvements in athletic performance. Now, we’re all about minimizing leaks in the kinetic chain, but is locking out movement in the bench press enhancing applied strength? We suggest it is not. The strength-training world, if we can name such a thing, considers strength to underpin all performance success. That is a discussion we don’t necessarily disagree with. There is an obvious place to develop capacity of force production, absorption and re-utilization. The presence of capacity is moot to a large extent, given the surrounding components that may indeed inhibit strength application. The strength-training paradigm, when applied in fast and discrete movements, requires that preplanned movements rely on much less proprioceptor-derived information about movement errors. Such preplanned movements are, generally, low frequency movements in sport and rarely contribute to success. In other words, if you are an athlete moving in multiple directions at speed, you don’t get a lot of time to spend on set up! Imagine you are in a mixed martial arts (MMA) match, standing with your back against a cage pushing someone off you—which is just a bench press in a standing position. Now, imagine you don’t have rotary and transverse plane stability. You will find that you don’t get the opportunity to express the strength that you’ve been developing in your bench press training. Even a poorly skilled opponent will be able to recognize and respond to this lack of tri-planar stability. Can you imagine meeting someone with the similar bench pressing ability but has appropriate control in all planes of movement? The likely outcome is that you will be thrown to the floor. Hard. What if you do end up stuck on your back? The upside is that you do at least have the chance to use all that bench press training once more to get someone off you. However, it’s much harder to lift your chest off the floor when someone is on top of you pinning you down and literally squeezing your rib cage shut. As anyone who trains MMA will tell you, if you take the time to lock out by extending your spine and drawing your shoulders blades together, you’ve just given your opponent plenty of time to react and elbow you in the head. Maybe you were better off just having the anterior spine and hip stability in the first place so you could explode into action! 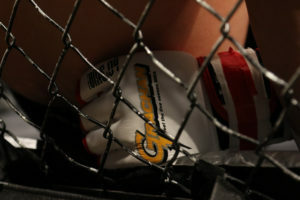 For an MMA fighter at least, the alternative is a very, very bad night. This is, of course, not the case in power events like strongman, with its slower movements. However you still need to be able to control movement errors. So, bench pressing with a powerlifting technique strips the strongman or woman of the opportunity to develop responsive movement against load. Just like our MMA fighter, there are examples of how learning to respond to movement perturbations against load matters in explosive sports as well as for the slower, grinding strength sports. As such, strength, while highly important for acceleration, deceleration and all forms of force absorption, production and re-utilization, requires support from underpinning movement skills that are not trained through uniplanar strength training for maximum exertion. Such underpinning movement skills have been proposed to indeed be the limiting factor in many sports successes . So, let’s look again at why you’re using the bench press, and be honest about whether or not you need reflexive stability in surrounding components such as the trunk. Rarely does anyone bench just to do bench. Choosing the lock-out option works for powerlifting technique, but what if you don’t get to choose the forces that might interfere your favorite start position? The absence of reflexive control of spine extension can be controlled against in the bench press by locking out, but locking out is not an option in running, pushing oneself up from the floor in a press-up, the wind-up of throwing and hitting or the fending off of an opponent pressing against you in MMA. By losing the rib flare (chest up) position, you’re increasing your arm’s range of motion, which is an opportunity to improve reflexive stability in a broader range of positions, thereby improving your opportunity to respond and then adapt to environmental stability, defined as function. So what is an alternative to locking out the spine in a bench press? Learning to reflexively control against the spine extension component. How does one do that? Narrow the base of support at the feet. Do not bring the feet under the pelvis to prevent the anterior rotation—keeping the spine and pelvis free to respond to perturbations. Bring the weight down, get on the edge of your mistake where you start to lose control of the start position and give your body the opportunity to control for the mistake. You may need other postural positions with a horizontal upper body push to stimulate the reflex control over extension and tri-planar perturbations. Always remember this question—Why are you benching? Can you get more from the bench press than what you’re currently getting by using the locking out approach? Could you be enhancing neuromuscular learning of the whole body while you are pressing? If anyone doubts what we suggest above, go ahead and test your single maximum one-hand dumbbell press with a lock out. Compare it to your maximum barbell bench press. Is it half? Our guess is if you are truly approaching half the maximum barbell weight, you will fall off the side of the bench. Don’t laugh, one of the authors has seen this happen. Don’t get us wrong, we are not saying do not use the lock out method. Yes, the lock out position is a valid option. 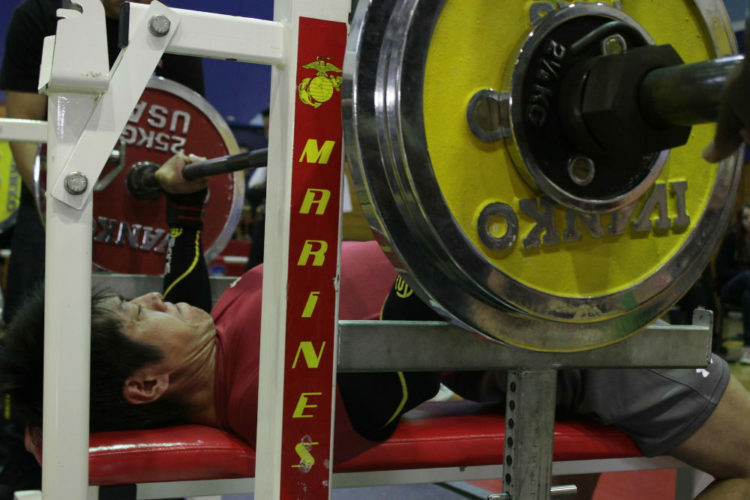 If you want to get a maximum bench press, you’re going to need to use it. The true question is, do you need to train for your maximum bench press by only using a lock out method? The authors think that you may need other things to translate that strength to athletic performance. The lock out strategy has been used in rehabilitation of gold-medal winning volleyball players, endurance runners and repeat sprint athletes along with supplementary exercises like “The Baby Get Up”. Such strategies permit the improvement of an element of a pattern. There are indeed two options for fixing movement mistakes: lock them away so they can’t happen OR develop the competency to control for them. The first option will have limited carryover to applied strength whilst the second option will be more valuable than simply pressing for maximum load. Let’s not forget the powerlifters. Advanced lifters know that long term gains are slow and hard won. It would be worth asking the question: Could a power lifter, who is unknowingly using the lock out position to compensate for a lack of spine and hip extension stability, obtain a bigger lift in the bench press just by removing this compensatory hand brake? Or to put it another way, could plugging the energy “leak” in extension result in more forward force, producing bigger bench numbers? As we have already said, the reflex is there whether you want to acknowledge it or not. We certainly think this is a direction worth further exploring, not just in the bench press example we’ve used but in any training movement. In any case, we consider it imperative to measure if the increase in maximal bench-pressing strength carries over to an improvement in athletic performance. For a powerlifting athlete, there’s clearly a correlation and the numbers won’t lie. For other athletes, you have to prove the carry over. If the carry over is not there, where do you go next? 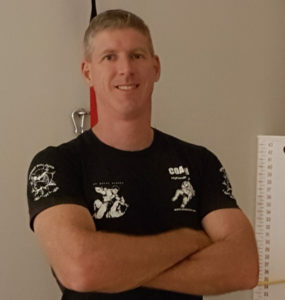 Rod Harris is a practicing Osteopath in the Southern Highlands of NSW in Australia. He has a broad range of experience treating everyone from professional athletes to the general population, adolescents to senior citizens. Additionally, Rod has been an active competitor in Mixed Martial Arts events as both an amateur and professional fighter and is currently an MMA coach. He has also taught advanced hand to hand & weapons combat tactics and techniques to police, prison tactical response groups, and security guards, as well as self-defense for all populations. It was his experience in traditional martial arts that had Rod look more closely at how fundamental human movement underpins elite athletic performance. 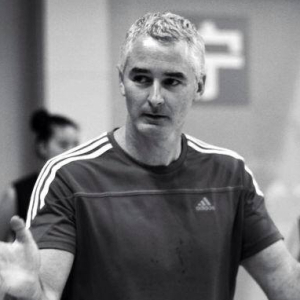 Rod uses the SFMA & FMS in daily Osteopathic practice, personal training and group fitness settings. In addition, Rod also uses the FCS and YBT in MMA coaching. Rod also holds certifications as a personal trainer, sports coach, a kettlebell instructor and nutrition coach. Hodges, P.W. and K. Tucker, Moving differently in pain: a new theory to explain the adaptation to pain. Pain, 2011. 152(3 Suppl): p. S90-8.